Carnation is a city in King County, Washington, United States. The population was 1,786 at the 2010 census. Settled in 1865, Carnation was officially incorporated on December 30, 1912, as Tolt. The name was changed to Carnation in 1917, back to Tolt on May 3, 1928, and finally back to Carnation again on October 29, 1951. The name Carnation was chosen to honor a nearby research farm operated by the Carnation Milk Products Company. Carnation is located at 47°38′54″N 121°54′31″W﻿ / ﻿47.648234°N 121.908630°W﻿ / 47.648234; -121.908630 (47.648234, -121.908630). According to the United States Census Bureau, the city has a total area of 1.18 square miles (3.06 km2), of which, 1.16 square miles (3.00 km2) is land and 0.02 square miles (0.05 km2) is water. The city is located on the east bank of the Snoqualmie River just north of where the Tolt River joins in. Camlann Medieval Village, a living history museum of a medieval English village, is located approximately four miles north of Carnation. Founded in the early 1980s, Camlann is devoted to teaching and entertaining schools, clubs, families, and individuals about what life in England in 1376 would have been like. Remlinger Farms is a functioning farm located less than a mile outside of the town center where families can spend time around and crops, eat locally raised and grown food, and go on fun park rides. As of the census of 2010, there were 1,786 people, 631 households, and 474 families residing in the city. The population density was 1,539.7 inhabitants per square mile (594.5/km2). There were 665 housing units at an average density of 573.3 per square mile (221.4/km2). The racial makeup of the city was 85.8% White, 0.9% African American, 1.0% Native American, 3.1% Asian, 0.1% Pacific Islander, 7.1% from other races, and 2.1% from two or more races. Hispanic or Latino of any race were 12.7% of the population. There were 631 households of which 45.0% had children under the age of 18 living with them, 58.5% were married couples living together, 10.0% had a female householder with no husband present, 6.7% had a male householder with no wife present, and 24.9% were non-families. 19.0% of all households were made up of individuals and 6.9% had someone living alone who was 65 years of age or older. The average household size was 2.83 and the average family size was 3.24. The median age in the city was 34.9 years. 30.1% of residents were under the age of 18; 6.8% were between the ages of 18 and 24; 29.4% were from 25 to 44; 27.7% were from 45 to 64; and 6% were 65 years of age or older. The gender makeup of the city was 49.8% male and 50.2% female. Carnation has a high rate of home ownership for King County; 73.31% of the homes in Carnation are occupied by people who own them. This rate is considerably higher than nearby cities like Redmond (50.19%), Bellevue (53.78%), and Seattle (44.91%). As of the census of 2000, there were 1,893 people, 636 households, and 487 families residing in the city. The population density was 1,728.4 people per square mile (664.4/km2). There were 650 housing units at an average density of 593.5 per square mile (228.2/km2). The racial makeup of the city was 91.76% White, 1.32% Native American, 3.59% Asian, 0.16% Pacific Islander, 1.80% from other races, and 1.37% from two or more races. Hispanic or Latino of any race were 3.91% of the population. There were 636 households out of which 48.9% had children under the age of 18 living with them, 61.8% were married couples living together, 9.9% had a female householder with no husband present, and 23.4% were non-families. 17.5% of all households were made up of individuals and 7.2% had someone living alone who was 65 years of age or older. The average household size was 2.98 and the average family size was 3.40. In the city the population was spread out with 34.4% under the age of 18, 6.6% from 18 to 24, 37.5% from 25 to 44, 15.9% from 45 to 64, and 5.7% who were 65 years of age or older. The median age was 32 years. For every 100 females, there were 98.6 males. For every 100 females age 18 and over, there were 96.5 males. The median income for a household in the city was $60,156, and the median income for a family was $64,167. Males had a median income of $46,667 versus $33,281 for females. The per capita income for the city was $21,907. About 5.8% of families and 6.7% of the population were below the poverty line, including 7.5% of those under age 18 and 6.5% of those age 65 or over. Carnation is in the Riverview School District which consists of 4 traditional elementary schools and a homeschooling parent partnership program: Carnation Elementary and PARADE Program, Cherry Valley Elementary, Eagle Rock Multi-Age, and Stillwater Elementary, a single middle school: Tolt Middle School, and a single high school: Cedarcrest High School. 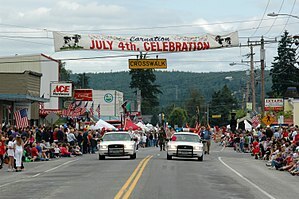 Carnation Elementary and PARADE: Located in Carnation, Washington 32239 E. Morrison St.
Law enforcement services in Carnation has changed hands several times throughout its history. Until late 2004, the King County Sheriff's Office provided law enforcement services to the city on a contract basis. From late 2004 until January 1, 2014 the city contracted with the City of Duvall Police Department for law enforcement services. Effective January 1, 2014 the city is again contracting with the King County Sheriff's Office. The contract with the KCSO provides for one full-time dedicated officer to the city, when that officer is not working KCSO Deputies patrolling neighboring unincorporated areas will respond to calls in the city. ^ "Carnation". Geographic Names Information System. United States Geological Survey. ^ Majors, Harry M. (1975). Exploring Washington. Van Winkle Publishing Co. p. 91. ISBN 978-0-918664-00-6. ^ "Carnation, WA Property Ownership". Carnation Real Estate Market. RealEstate.com. Archived from the original on 10 August 2014. Retrieved 28 January 2013. ^ a b c King County and Local Landmarks List[permanent dead link], King County (undated, last modified 2003-02-26). Accessed online 2009-05-08. ^ "Carnation Police Department" (PDF). www.carnationwa.gov. Retrieved 2016-03-29. Wikimedia Commons has media related to Carnation, Washington.